The first thing I saw when I came out of the Air Terminal was, in a shop window, an obese plaster gnome squatly perched on a plaster toadstool as it gnawed a giant plaster pie. Welcome to the country where Mouth is King, the land of comestibles! The next thing I saw were rats, black as buboes, gnawing at a heap of garbage. And the third thing was a black man running down the middle of the road as fast as he could go, screaming and clutching his throat; an unstoppable cravat, red in colour and sticky, mortal, flowed out from beneath his fingers. A burst of gunfire; he falls on his face. The rats abandon their feast and scamper towards him, screaming. Instead of the glamorous film star of his dreams, Tristesse de St. Ange, Evelyn finds a woman who draws him to her room. There this succubus, Leilah, takes the punishment Evelyn believes she deserves, the victimization she was born for. Their brief relationship, with its ongoing exchanges of power (or so Evelyn says) ends with pain and blood and a baleful triumph as Evelyn takes off for a drive across the country. That drive takes Evelyn to an underground desert land called Beulah, where a woman who has made herself a goddess called Mother decides to make Evelyn the bearer of her new world. Redubbed Eve, our protagonist must consider a fate previously unimaginable. I would say that, at this time, I was literally in two minds; my transformation was both perfect and imperfect. 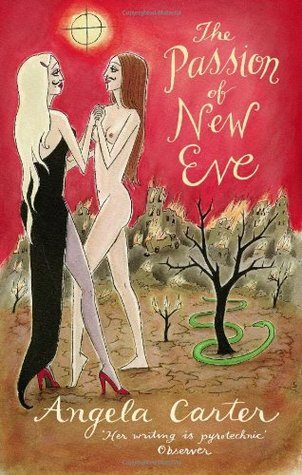 All of New Eve’s experience came through two channels of sensation, her own fleshly ones and his mental ones. What happens to Eve is different from merely making a man feel a woman’s experiences. Eve still has Evelyn’s mind. Yet living in his new Eve’s body causes changes in that mind. Although I was a woman, I was now also passing for a woman, but, then, many women born spend their whole lives in just such imitations. To what extent do our performances of gender constitute passing? The pressure to conform to gender norms is strong, so strong that many will conform despite their inclination. I’m sure there are some fascinating trans readings of this book, but this sense of passing resonates from a cis perspective as well, inasmuch as we might conform to social expectations of our gender even when we don’t feel naturally inclined to. Gender, in this book, seems to be very much about our relationship to others—but the book is unclear about the extent to which this is so. Calling a person a man doesn’t make that person a man, but can making a person act like a man make that person a man? I don’t think Carter answers any of these questions definitively, but she seems to allow for some degree of fluidity in gender. I like that she doesn’t nail her view down. Given that the book was written in 1977, the discussion doesn’t feel altogether dated as awareness of trans people is growing. The book seems like it can shift with the times as understandings change. The gender issues the book raises are what makes the book work for me, but the depiction of a dystopian America at war is less successful. I couldn’t wrap my brain around what Carter was doing here. As Eve takes her odyssey around the western U.S., she has experiences that feel like they’re supposed to mean something, but they don’t go anywhere. It’s just one set of oddball images after another. A revolving house, a band of young soldiers headed to California, and old woman on a beach. Her descriptions are potent, but I’m not sure what the potion is supposed to do. The last few chapters of the book were occupied with these images, plus a much too on-the-nose bit of birth imagery, and the good stuff was left behind. Oh Teresa, I have to confess that I have never managed to get on with Angela Carter. Her books are just TOO WEIRD for me, which is not a confession it pleases me to make. They are too weird without enough connective tissue of well-developed, interesting characters. And this one sounds like it is weird even by Angela Carter standards. This is the first of her books that I’ve read, but I gather that it is weird by her standards. The last several chapters in particular seemed really random. But I liked parts of it a lot and will try more. Oh, no! I have this book, too, but have always been nervous to crack it open because of the many reasons that Jenny lists above. I am not sure I will open it any time soon – seems like the same themes are covered in more readable ways in other books. In a way, the fact that the story was so out there was really great, but I think the book was best when it was more focused on the gender stuff. All that was strange enough without throwing in the dystopian odyssey. Don’t know much about the book…..but i love suspense,cause it keep me with the book. It might be a book i can try.